The model and #effyourbeautystandards advocate stars in Addition Elle's fall 2015 capsule collection campaign. 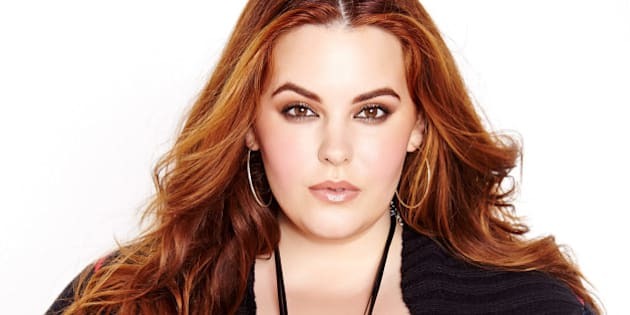 Get ready to see more of Tess Holliday in Canada! The 29-year-old model has been tapped to star in Addition Elle's fall 2015 capsule collection campaign, following in the footsteps of other fashion influencers, Ashley Graham and Nadia Aboulhosn. Called the "Decadent Folk" collection, the line features '70s-inspired pieces perfect for fall, including sculpted jeans, classic plaid shirts, fringe accents and a suede lambskin moto jacket, all modelled by the #effyourbeautystandards advocate. The standout piece? A navajo inspired-printed cardigan with fringe details. Holliday, who is the first model of her size and height (size 22, 5'5) to be signed to a major agency, told eTalk the partnership with the Canadian retailer was a "no brainer." "I've loved their stuff for a while, and to be honest I haven't had much of a presence in Canada and they are definitely the leading competitor in Canada and their stuff is really fashion-forward and fun," she said. The Addition Elle Decadent Folk Collection is available in sizes ranging from 12 to 24 and is available in store and online.